Blaise has an occupational therapist (who also acts as her physical therapist). Her name is Leslie and she's fantastic. She's been great at encouraging Blaise to work on her gross motor skills while having lots of patience with Blaise's stubbornness and a sense of humor about her tendency to circumvent therapist tricks like putting toys out of reach. Her assessment of Blaise's current motor development: "She's doing her own therapy." To be clear, she's still behind on gross motor and we're not saying goodbye to Leslie any time soon. The thing that's changed is that Blaise is initiating a lot of the exercises that Leslie was previously coercing her to do. A couple of weeks ago, she would roll to her back automatically; now her "base" for play is her belly. She spontaneously pushes up onto her hands and knees to rock back and forth. She tries to pull herself up on the rail of her crib and to use me and Ben as climbing equipment. This is a huge change. We can tell that it's exhausting and difficult (to use Ben's words: "I can see her cerebellum overheating"), but she's doing it anyway. And once Blaise decides she's going to do something, there's no stopping her. Help us all. 1) Our daughter REALLY likes mashed carrots and turnips. 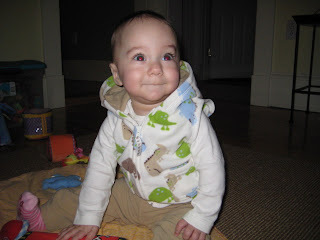 Erin and I still consider ourselves faux New-Englanders, but I think this means Blaise is officially native. 2) Leila the cat will tolerate having her face grabbed by a curious baby for a surprisingly long time. 3) Babies really like looking at other babies, even over Skype. We learned this from watching Blaise talk with her friend Erin in Paris...we are convinced they were conspiring to paint the town red once they end up on the same continent. A side note: Blaise has now seen England and France thanks to the series of tubes that is the internet. 4) Pureed squash and apple is fine and all, but hot coffee, red wine, chocolate pie, and other things that are dangerous to people and their nice clothes are much more exciting. Our apologies for vanishing from the blogging world for a bit there. To say that things have been crazy in our house would be a bit of an understatement. Blaise is great. She's down to 8 hours a night on the pump and we think we're good to go down to 6/night this Thursday. She is not a fan of green beans, but continues to be obsessed with peas. Some parents mix applesauce into veggies to get babies to eat them. We mix peas into applesauce to get Blaise to eat the applesauce. Her babbling has exploded and she seems to have learned to modulate her volume (mostly toward the loud end). She has also begun crawling! She only goes backward at the moment, but we get the occasional forward scoot. Her therapist says that most kids crawl backward before they go forward. We have a feeling that forward is only a day or two away. I was surprised how fast she is able to move backward, too. Of course, this learning to crawl business coincides with moving back into our apartment after the deleading. The workers made quite a mess, so we had to keep Blaise pretty isolated in her own room until we got the rest of the house clean. Thankfully, we have wonderful friends who like to play with her. If you know a family with a baby and they're moving or having work done on their house, the most useful thing you can do is offer to entertain the baby. Seriously. Talk, talk. Where are the pictures? Here you go. 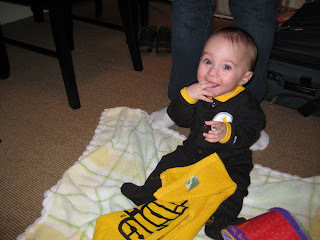 Earlier this week was Blaise's first Monday Night Football Steelers game. It started well after bedtime, so she got some Terrible Towel waving in early. We have discovered Blaise's favorite food. We were nervous about giving her peas because they were the first non-sweet non-Elecare-flavored food we were going to try. The response: a HUGE grin and eager grabbing for more. Seriously, Blaise would eat nothing but peas if we let her. We gave her some whole steamed peas last night and she had a great time playing with them, too, but none of them made it to her mouth. We also returned to apples for the first time since the blood stopped. Things got a little, um, runny, so we've put them on hold for a couple of days and then we'll try again. The runniness could also have been fallout from her double flu vaccines on Tuesday. We did a quick weight check while we were in for the shots and are proud to report that she has cracked the 15 lb mark (15 lbs 1 oz; up 10 oz in less than 2 weeks!). We've bumped down to 8 hours/night on her tube feeds. On the developmental front, Blaise has discovered the joy of taking items out of containers and occasionally of putting them back in. She's also begun raising her arms to be picked up, imitating sounds that we produce (just clicks) and giving wonderful, sweet proto-kisses. She'll deliberately turn to me or Ben, open her mouth and press it against our cheek. That might be the best thing ever. I'm not sure we've had quite so crazy a week since Blaise came home, but I am pleased to report that we are now settling into our temporary apartment in Arlington while our Cambridge apartment is deleaded. So far, no panicked emails or phone calls from our landlady, so we're hoping it stays that way. As though packing up everything and moving with a ten-month-old weren't enough of a project, our babysitter got sick and cancelled one day this week and I was occupied with a conference all weekend. We made it, though, and we have to send a huge public thank you to our friends who helped out, both by taking Blaise for a day and by helping us pack up and move. There are good friends and then there are the kind of friends who don't run screaming when they meet what lives in under your bed and in the back of your fridge. We are incredibly fortunate to have the latter. Blaise made an appearance at the conference on Friday afternoon, much to the delight of blog readers who are also child language researchers. (There are a lot of you. I had no idea, but we really appreciate your support!) She didn't give a presentation this year, but I'm thinking to submit her name for the keynote next year. Her working title is "Maanabamaana: !nananama." Yes, that is an alveolar click; it's her new favorite sound. Although by this time next year, she should have some actual words. More pictures, soon, I promise. Once I find the camera. I posted a little while ago about a family whose little boy is struggling with mitochondrial disease and who were having a house fully equipped for him. Gavin has been declining severely for the last week or so and his parents made the difficult decision late last night to give him peace. His ventilator will be turned off tonight, after his extended family has had a chance to say goodbye. Please keep Gavin, his parents and especially his older sister in your hearts. I'm afraid that no one won the guess-Blaise's-weight game. The rules were closest without going over and everyone went over. No one went with the classic Price is Right strategy of guessing 1 dollar. We're glad you think she's such a rockstar, though! Blaise weighed in at 14 lbs. 7 oz. (6.57 kg) on Thursday. She might be bigger since then; she's eating really well. Our weekend was spent dressing a bewildered Blaise in her pirate outfit, eating delicious food with friends (Merry Thanksaween!) and packing up our house. It turns out that Cambridge requires all apartments rented to families with children under 6 to be certified lead-free. Let's just say that our 100+ year old apartment was very much not lead-free. Blaise's lead levels are totally fine. It not like she's chewing on the windowsills, but the law is the law. So we're moving out on Sunday for a couple of weeks while our house is deleaded. It's a big pain, but the upside is that we'll come home to fresh paint, new windows and a professional cleaning job. Our temporary apartment is just around the corner from some good friends and only down the (really big) hill from some others, so we'll at least be in good company.